For some mysterious reason, Portuguese music from whatever century has never attained the popularity it so richly deserves, so this disc is welcomed with open arms. Even since 1580, when Portugal was ruled by the Spanish, there was always the hope that one day, the Portuguese monarchy would be restored. By 1636, a considerable amount of patriotism had been generated towards this goal, and the person on whom these inspirations were centred was the Duke of Braganca. Composers associated with the Duke chose to reflect these ties and hopes for an independent monarchy in the titles of a considerable number of their published masses. 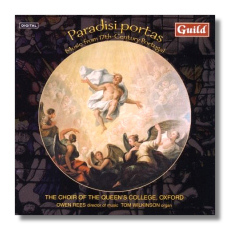 The name of this album is a case in point as the 'Missa Paradisi Portas' (The Gates of Paradise) is a piece written by Manuel Cardoso, one of the Duke's closest friends. Four years after this mass was composed, the Duke became King John IV of Portugal. What makes this issue so interesting, apart from its political undertones, is the fact that it includes Portuguese composers working in Spain at the time, such as de Brito and de Aviles, and vice versa in the figure of Lopes Morago. The programme is punctuated by some organ pieces, giving an all round balance to a project wonderfully conceived and sublimely executed. As from the very first-track; Lôbo's 'Audivi vocem de caelo', the Choir from Queen's College Oxford instantly present the outstanding credentials of these amazing performances. Owen Rees never rushes the music, and he treads with aplomb through the fine line between ecstatic excitement and shimmering splendour. Tom Wilkinson's organ renditions are given a spacious approach, allowing the pieces to reveal all their hidden riches. A winning disc of some unusual but captivating repertoire.